Home » »Unlabelled » The Worship Music Battle...Why Is This Still Happening? 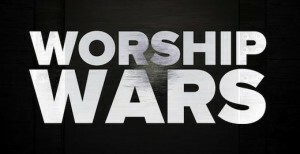 The Worship Music Battle...Why Is This Still Happening? Why is there STILL such a massive debate over traditional worship music vs. praise and worship music? People will say ‘it’s about worship…hymns express worship better than praise and worship music…and vis-verse. Nevertheless the issue still stands. Then there are times that I sing a praise and worship song and the same thing applies…JESUS just showed up. And then…I’ll be singing a praise and worship song, and there is nothing. Just another song. The thing is that BOTH camps are horribly wrong. The thing is that WORSHIP MUSIC IS NOT ABOUT YOU!!!!!! It is our response to our Savior, and there are moments that a hymn fits the moment, and God speaks through it, and your heart is blessed. Then there are times that a praise and worship chorus melts the heart and shows you a glimpse of who Jesus is. There is no set magic to one style of songs. BOTH CAMPS need to learn to step out of their comfort zones, and look at the music as an avenue to worship Jesus. If you find yourself in either one of these camps you might consider repenting and stop making the music about you and make it about the one it should be about!